Range: It can be found in south - central Africa, including parts of Zimbabwe, Botswana, Zambia, Angola and South Africa. 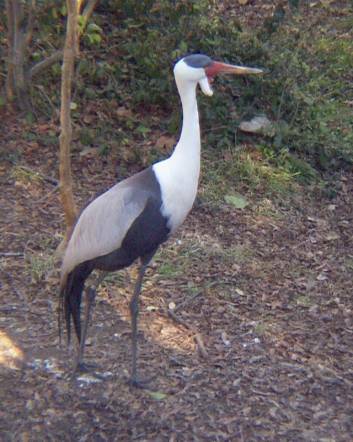 The Wattled Crane is the largest and rarest of the six crane species that occur in Africa. The main population is found in south-central Africa, with smaller populations in Ethiopia and South Africa. Its total population is estimated to number between 13 000 to 15 000 birds, of which more than 90 per cent occur in Zambia, Botswana and Mozambique. Over the last few decades, the species has declined in parts of its range, with the greatest decline occurring in South Africa. The South African population is listed as critically endangered under the revised IUCN Red List categories while elsewhere it is ranked as vulnerable. The Wattled Crane is the most wetland dependent of Africa's cranes. Nesting pairs establish large territories, generally in shallow wetlands with minimal human disturbance. Wattled Cranes breed in winter - they lay a clutch of one or two eggs, but only rear one chick. Wattled cranes builds more than one nest - up to four. It will use one nest one year and another the next. It may reuse an old nest at any time. No one knows why.Also, The females of most crane species lay two eggs in a nest - three to five days apart. Often both eggs will hatch, but one chick is older. It beats up on the younger one, which usually dies. 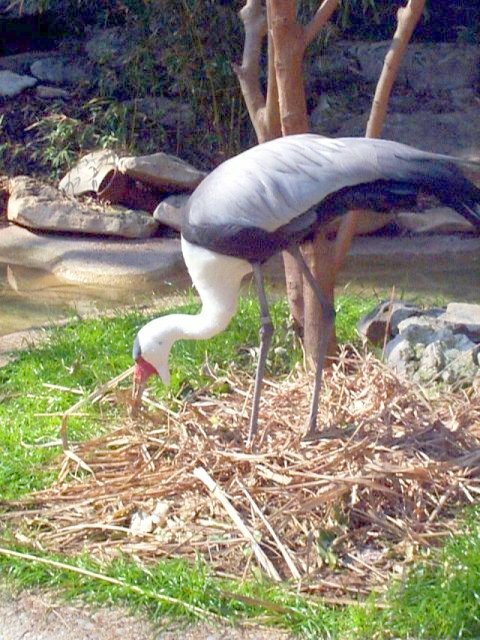 Wattled cranes, though, lay only one egg at a time. With two eggs, the chance is greater of at least one surviving. Their diet consists of aquatic vegetation and fauna, but also includes seeds, insects and grain in drier habitats. The movements of Wattled Cranes are poorly understood. In some areas they are clearly resident year-round, whereas in other parts of their range they are subject to local movements. The function of the "wattles" in the wattled crane is not known. However, the size of the wattles increases during aggression and decreases when the bird is afraid or submissive. Wattled cranes have the longest incubation (40 days) and fledgling (over 100 days) period of any of the cranes. Chicks reach adult height and can fly by four months, but are not sexually mature for 4-8 years. Frederick Beall, curator of birds and reptiles, Franklin Park Zoo, Boston. 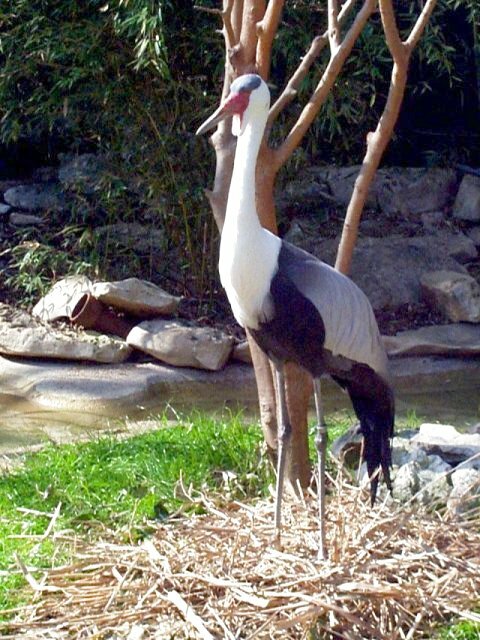 Beall also coordinates the species survival plan for the wattled crane for the American Zoo and Aquarium Association. ROBERTS' BIRDS OF SOUTH AFRICA. G.L. Maclean. John Voelcker Bird Book Fund, Cape Town, 1985. SOUTHERN AFRICA'S THREATENED WILDLIFE. J. Ledger. Endangered Wildlife Trust, Johannesburg, 1990.